The charges to use the Severn crossings between England and Wales have been removed with both bridges toll-free for the first time since the original crossing opened 52 years ago. The UK Government said removing the tolls will save regular commuters around £1400 per year and provide an estimated annual boost of over £100m for the Welsh economy. Businesses will also benefit from strengthened links between communities ranging from west Wales to the south west of England by making it easier for consumers and employees to cross the border. 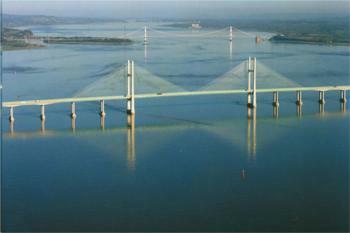 Tolls have been charged on the Severn Crossings since 1966. The final driver to pay to cross over from England to Wales on Sunday (16 December) was the Welsh secretary, Alun Cairns. Mr Cairns said: 'The end of the tolls is a major milestone for the economies of south Wales and south west of England, and will remove historic barriers between communities. Scrapping the tolls means an end to generations of people paying to simply cross the border, and delivering this has been one of my key aims as Welsh secretary.